JBL Flip 4 Bluetooth Speaker offers a rich sound quality with deep bass. 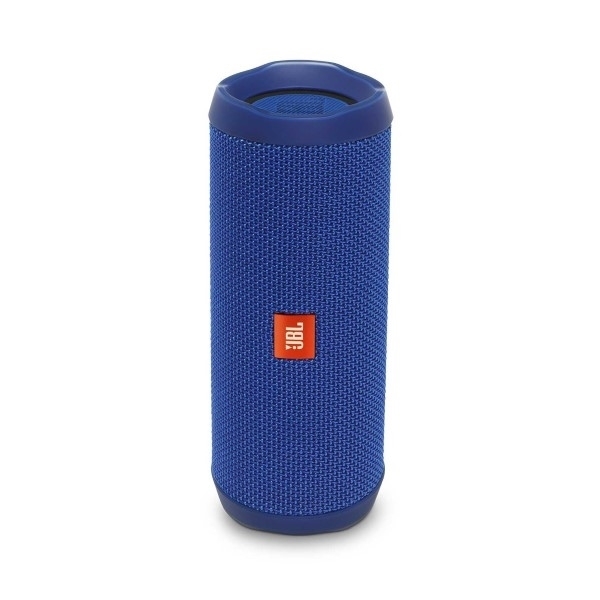 This portable speaker lets you carry your music wherever you go.If you love loud music, the JBL Flip 4 Waterproof Portable Bluetooth Speaker is an ideal pick for you. This speaker incorporates a bass radiator that produces a deep, pounding bass and loud, distinct sound output. With a built in noise and echo canceling speakerphone, you can take calls and have nonstop crystal clear conversations. It flaunts a waterproof design that allows you to carry it in all weather conditions, be it rainy or sunny. This lightweight and compact speaker fits easily into your purse or backpack. For a thrilling and amplified listening experience, this speaker supports the JBL Connect Plus technology that lets you sync multiple Connect Plus enabled speakers together. Access Siri or Google Now or play music at the press of a button, thanks to the built in voice assistant integration feature. Available in a bold black finish, the JBL Flip 4 Portable Bluetooth Speaker looks stunning and delivers an immersive and high fidelity sound quality. Enjoy up to 12 hours of audio play on this speaker, thanks to its massive 3000mAh Lithium Ion rechargeable battery. Ubl connect+ allows you to Link more than 100 JBL connect+ enabled speakers together to amplify the party.